The Chicago Blackhawks got two critical points in the standings with their win over the Minnesota Wild on Tuesday, but they also made some remarkable history thanks in large part to the efforts of Jonathan Toews. 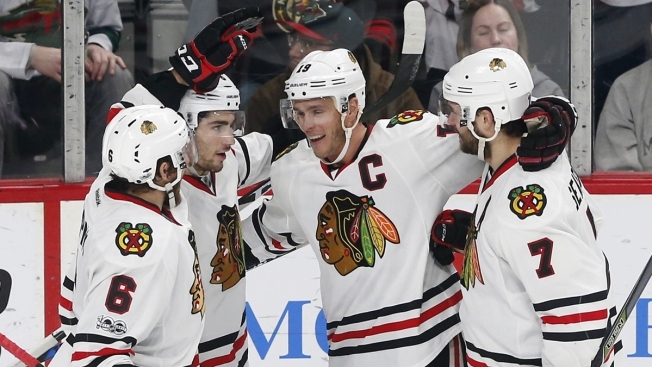 The Blackhawks’ captain scored his fourth career regular season hat trick in the victory, including an empty net goal with a minute remaining that sealed the game. By doing that, Toews helped the Blackhawks to tie a franchise record for consecutive road victories, as the team has now won seven games in a row away from the United Center. The Blackhawks won't have an opportunity to break that record for at least a little while, as their next four games are on home ice. They'll next hit the road on March 4 when they travel to Nashville to take on the Predators in a Central Division showdown. Not only did Toews help the Blackhawks make history, but he also made some history of his own. According to Christopher Kamka of CSN Chicago, Toews is the first Blackhawks player to notch points on all five of his team’s goals since Gary Suter accomplished that feat in 1995 with a one goal, four assist outing. Toews wasn’t the only one who made history on Tuesday either. By gaining the victory, head coach Joel Quenneville reached the 400-win plateau with the team, making him only the second coach in Blackhawks history to reach that milestone. Quenneville will have to coach at least a few more seasons to catch the top name on the list, as Billy Reay still holds the team record with 516 career victories in 1012 career games as the man behind the Blackhawks’ bench.